The matte gold looks really smart whilst those two pairs of footprints just melt our hearts. These are the real twins' footprints: it must have been a slightly messy endeavor! The letterpress technique is perfect for this: it presses into the paperstock and really captures the idea of a tiny footstep! Emily is going to frame one of these for the wall of the nursery! 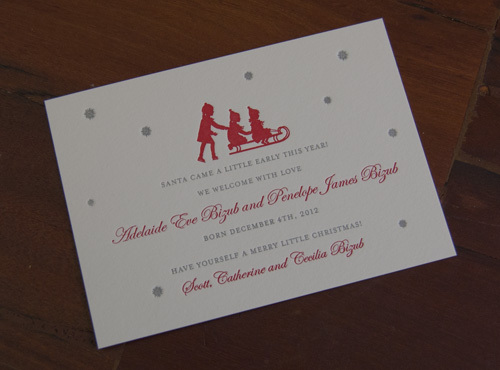 The combination of bright red and matte silver is perfect for the holiday season and we love how the image works perfectly for the family!